Another rollicking afternoon of poetry, storytelling, random singing and music, and other shenanigans. Last month we had a man named Herb playing a large steel spring hanging from the mic while he recited Robert Mitchum's classic The Ballad of Thunder Road. 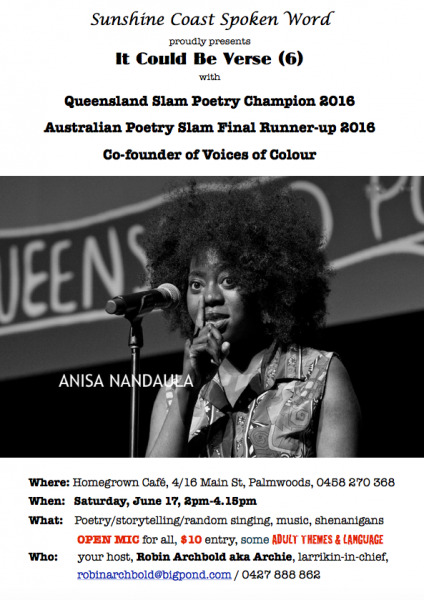 This month's special feature is reigning Queensland Slam Poetry Champion and Australian Poetry Slam Runner-up, Anisa Nanduala doing 20 minutes of high-octane performance fer yews. There's also an open mic section for beginners to pros(e). Beware adult sensibilities and content, and it's $10 cash at the door of the coffee roasting shed up the lane beside Homegrown Cafe. Come early and indulge in fine food and coffee in a picturesque hinterland cafe, oooh-la-la. Hosted by larrikin-in-chief and SCSW Grand Poobah, Robin Archbold aka Archie.